Summer is upon us. No two thoughts on that. I am functioning like half my brain has melted already. Copious amounts of ale has been drunk in the name of managing the heat! and power cuts for 3-4 hours a day are a reality (also very annoying in the mornings when breakfast has to be made). A few months ago, I found a blog I loved. Sadly it is no longer available and I am forced to remove the link. 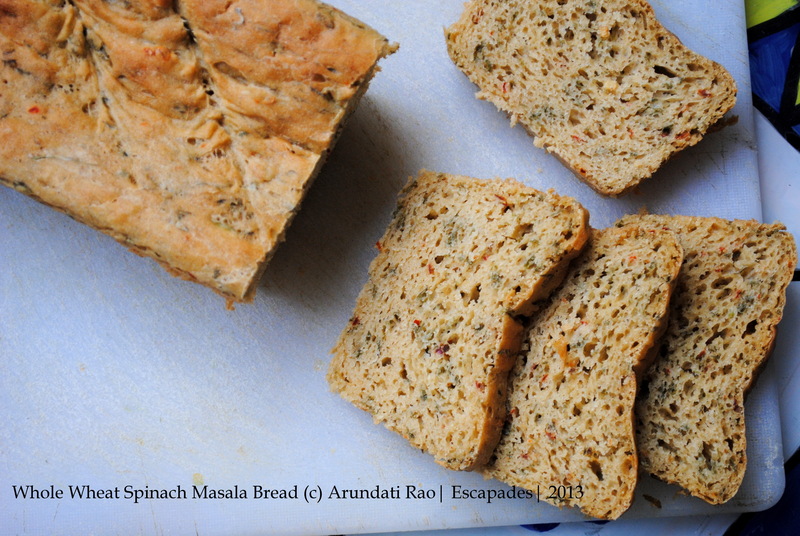 But I was inspired by a bread recipe to bake this bread and am sharing the recipe here. 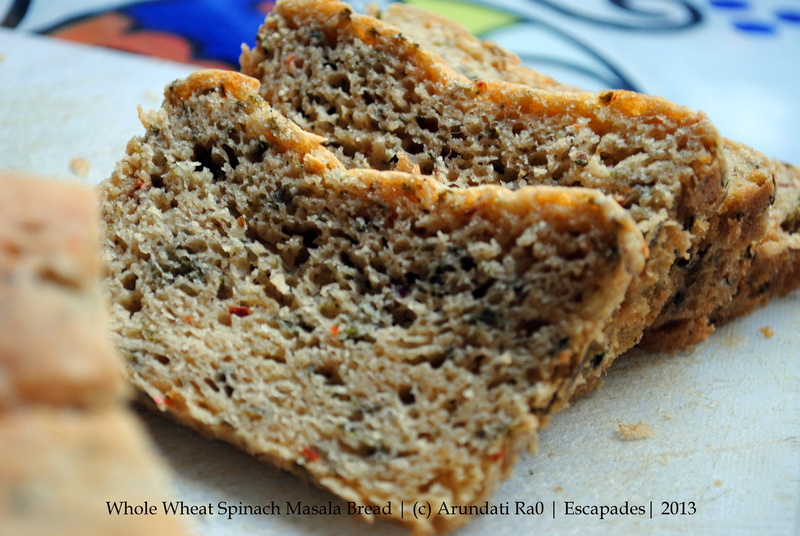 In between all the whining I have been doing, I baked this Whole Wheat Masala Bread. I swapped out a few ingredients for what I had on hand. It turned out fabulous… toasted or not, plain or with butter… it was yummy! I’ve been using wholewheat (chapati) flour for a lot of bread baking and also cakes and the like. I think because I use the food processor to make the dough, I do not get a crumb as fine as is shown in the original recipe… not a deterrent tho because the bread itself was delicious. I also had to bake it in a tin because my dough was too, how shall I put it – loose? It wouldn’t hold shape. The only thing I wish I had not done, was to leave the loaf in the tin to cool off for a couple of hours. the steam trapped between the bread and the tin, made it wet. Once the loaf was removed from the tin and left to air dry, all was well again. Add the sugar and warm water to the warm milk, add the yeast and stir to dissolve a bit. Leave it in a warm corner for 15 minutes to froth up. This step is very important to make yeasted bread. If the yeast does not froth, the bread will not rise. Mix together the whole wheat flour with the salt, red chilli powder, turmeric, asafetida and cumin powder. Add the chopped spinach to the flour and toss it about. Add the ginger garlic paste to the milk – yeast and mix well. Pour it into the flour with the oil and mix. Add enough water to make a pliable dough. I used the dough blade of my food processor to do this. This dough is easy to make without any equipment as well. Knead the dough for a few minutes till it resembles a sticky mass. Leave covered in a well oiled bowl to rise for about an hour. After an hour, when the dough has doubled, tip it onto a clean surface, dust with a little dry flour and knead for 5 minutes, using the heel of your palm. If it feels sticky, add more dry flour, but sparingly so. Adding a lot of flour will make it easy to knead the dough, but give you a very tough and hard loaf of bread. Shape it into an oval loaf and place on a baking sheet lined with foil or baking paper. Or place it into a loaf pan. Cover with a clean cloth and leave to rise for the second time until it is doubled in volume. If you live in India, that’s about 40 to 45 minutes, but may take more time. In the meanwhile, preheat the oven to 400 F or 200 C.
When the second rise is done, place the risen dough in the preheated oven and bake for about 30 minutes. When the top has lightly changed colour, remove from the oven. Let it cool for 5 minutes in the pan before removing it from the pan and leaving it on a wire rack to cool completely. Cover the cooling loaf with a clean dry cloth at all times. I left it in the pan and wandered off for a couple of hours. The result was that the bottom of the loaf became soggy from the steam of the hot bread. I had to leave it out to dry out completely after that. Slice the bread after it is completely cool. Enjoy with a robust gravy curry like this, or this whole masoor dal , toasted as an accompaniment to chai or just slathered with butter. It tastes divine anyway you eat it. This bread has a shelf life of about 2 days in Hyderabad’s heat without refrigeration. You can store it in the fridge for a few days more, but I wouldn’t know, cos it did not last that long! Made this again!!!!! Always a hit!!! Can you please name other veggie options which can be added? Made this the other day….turned out delicious….but did not rise much…as much as I wanted it to. Hi Amrita. Glad you liked it. Did the yeast froth up nicely? This looks really good! Crumb or no crumb, youve got some good aeration in the loaf, something I dont always get when using whole wheat..maybe it is the Hyd heat! the bread looks fantabulous, just like you said. 🙂 I gotta try it soon.